C Clear Partners > Events > Party with (com)passion! Type ‘goede doelen Antwerpen’ (good causes Antwerp) into the Google search bar, and on page 8 of the search results (I know, we’re almost in dark web territory here) you’ll find an article referencing an organization called VAGA in passing. If you ask yourself how anyone would ever end up on page 8 before resigning to search-fatigue, the answer is straightforward: We were on a quest to find a local organization we could support with the proceeds of the then upcoming 2018 C-Clear Partners Charity Party, a tradition established in 2016, recurring yearly in October since. As you can imagine, a good number of good causes were listed on the previous 7 pages of our little search marathon, every single one worth being supported. But looking at VAGA’s website, a couple of things became apparent straightaway: They did not ‘waste budget’ on their website (the date of implementation and design couldn’t have been long after their founding year 1992 – more on this later), and the support they offer to families of children born with a facial defect doesn’t get much attention in the public eye, but certainly should! An article we found of an interview with the founder of VAGA, Mariette Vermeylen-Nuyts, described how she had built the organization out of nothing but her passion to help others cope with something she had to learn to deal with by herself. And since then, she hasn’t stopped giving her time and energy to the children and families impacted; offering advice, compassion, and her ever-open own home to serve as a haven. Katie loves music and wants to play the flute. But until she can have more operations to correct a defect with which she was born, her mouth cavity doesn’t allow her to get air flowing in a way that will produce a tone on her flute. This is the beginning of a story that takes you and your kids on a wonderful journey of discovery; Katie’s discovery that she’s not alone with her frustrations and in the face of these challenges, others have been able to find ways to follow their passion; and the reader’s discovery of what it can mean for a family to be confronted with a defect that forces a child to consider realities other children never have to deal with. 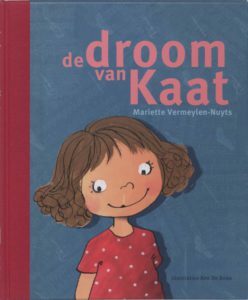 ‘Katie’s Dream’ is the title of the English version of the original Flemish book ‘de droom van Kaat’ written by Mariette and wonderfully illustrated by Ann De Bode which can be purchased on VAGA’s website and helps support the organization. The book was on sale at the C-Clear Charity Party and many of our team purchased one or more copies to read to their kids or to give to others. A tear was rolling down Marissa’s cheek and the overall nose-blowing and eye-drying activity in the room had risen considerably by the time Mariette had reached the final set of slides. Joe Cocker was singing ‘You Are So Beautiful’ to images depicting children impacted by a facial defect, and truly, each of them was beautiful in her or his own right. Mariette had been kind enough to take the time to present her cause again, this time to the entire C-Clear team during our monthly team meeting, and the emotional impact this had on us was not only caused by the children’s faces on the screen, but by Mariette’s tremendous show of dedication. She had given this presentation many, many times, but it was clear that none of the passion and will to help had dissipated. This is her purpose in life and it was easy to see that anyone she reaches will be impacted deeply. Due to the overwhelming number of books ordered, I suddenly found myself in Mariette’s apartment, sipping the tea she’d made. What I first expected to be a quick visit to pick up some books, soon resulted in a lovely afternoon. We talked about pretty much everything, which might seem strange, considering I had only met her a couple of times. But she has such a warmth, and a kindness in which you feel welcome and at ease, that having a conversation with her for hours seems like the most natural thing in the world to do. I could imagine parents, feeling out of depth with their newborns, arriving here and regaining composure, seeing light at the end of the tunnel. Because she has experienced it herself, without any help back then, she can relate to your feelings and offer guidance. The expert in finding specific pacifiers and adjusted teats for infants with a facial defect, amongst many other examples. While the elevator door was closing, and we were waving our goodbyes, I felt reenergized. And then it was time. Finally, it was the evening of the charity party we had worked so hard for in the last months and especially the last few weeks. It passed by like a whirlwind, but I’ll always remember the happy faces the moment we could announce the provisionally raised amount, our music band performing catchy eighties songs, all the laughter and fun, the midnight snacks and people dancing enthusiastically. We had all come together that evening, to above all join forces to empower and encourage vzw VAGA. Now that all the meetings were over, and weeks of preparation by many of our C-Clear members had led to an incredibly fun evening that has resulted in a financial contribution to VAGA, naturally we were curious to know what it would be used for. We were delighted to hear that 90(!) children would be able to go and see Cirque du Soleil in March of 2019 – https://www.cirquedusoleil.com/toruk – a wonderful Avatar-themed evening will allow all of them to immerse themselves in a phantasy world – a few hours during which there will be no need to think of appearances, doctors, or operations … just colours, sounds, and amazing artists. And while our charity events have been finalized for this year, our work with VAGA continues by upgrading their website and online presence with the Atom Ideas team.